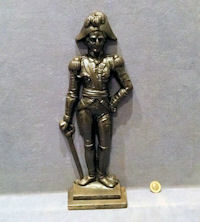 Original, quality late 19th century cast iron door porter / door stop or mantel ornament in the figure of The Duke of Wellington. This super example has had a couple of good repairs and has been cleaned and repainted black and is now complete and in good order. 14.5" tall x 6" widest and 2.25" front to back. Plinth 4.75" x 2.25". 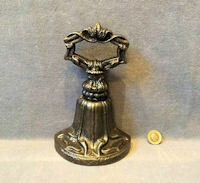 Original, quality late 19th century cast iron door porter in the form of a half bell shaped base with a stem of acanthus leaves with a ring grip to the top. The reverse is impressed "440" for the model number. All has been cleaned and lacquered and is complete and in good order. 14" tall x 4.75" widest at base and 2.5" front to back. is complete and in good and working order. 11.25" x 6.25" x 2.75" front to back. Original, quality late 19th century cast iron door porter decorated with acanthus leaf forms and curled down grips to the top. The reverse is impressed "Cross Ltd" for the manufacturer "William Cross" of "Birmingham" and "No 93" for the model number. All has been cleaned and lacquered, although the lacquer may be removed at no extra cost and is complete and in good and working order. 12" tall x 7.5" widest and 3.25" front to back. 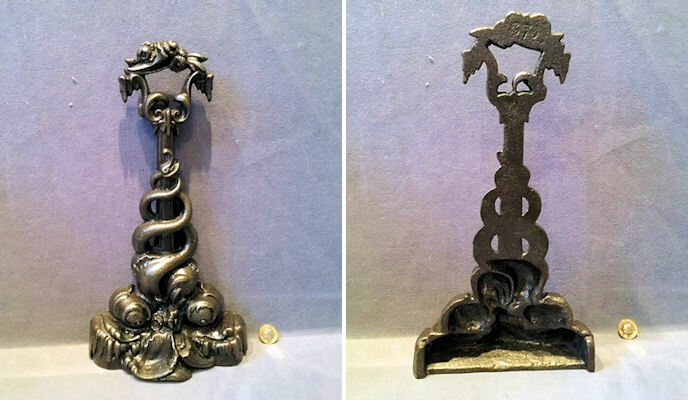 Original, quality late 19th century cast iron door porter / door stop with acanthus leaf designs to the body and a ring grip handle to the top. All has been cleaned and lacquered and is complete and in good and working order. 7.5", 5" widest and 2.5" front to back. Original, quality late 19th century cast iron door porter / doorstop in the very detailed form of two stylised entwining fish on a base of seashells with a ring handgrip to the top also decorated with shells. The reverse is impressed with '370' in script for the model number. This example is illustrated in the 1876 Catalogue for A Kenrick and Sons of West Bromwich but the model number is referred to as '470'. All has been cleaned and lacquered and is complete and in good and working order. 14.5" x 8" wide at base and 3" front to back at base. 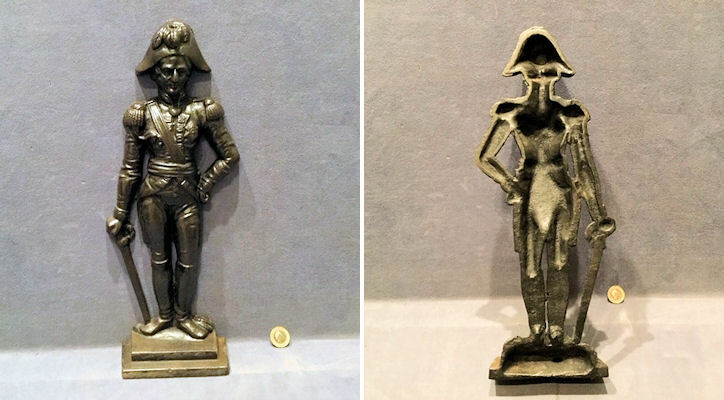 Pair of original, quality late 19th century cast brass door porters with semi circular bases and plinths with a detailed figure of the 'Lincoln Imp' sat upon the upright stem. 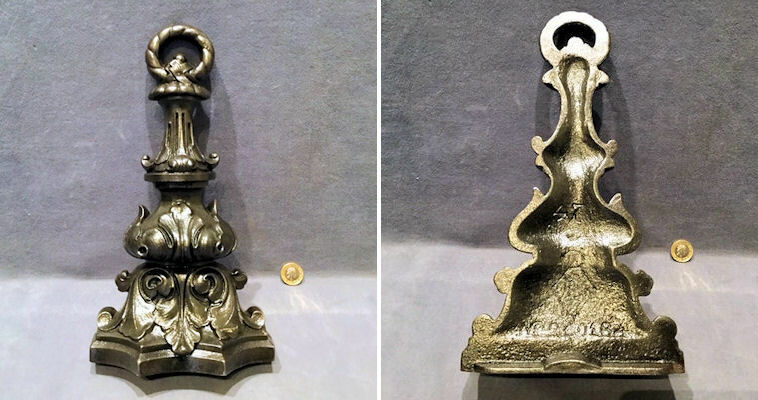 The bases are infilled with lead, the brass polished and lacquered, although the lacquer may be removed at no extra cost and all is complete and in good and working order. These are first of these porters we have seen. 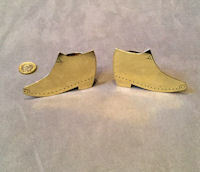 12.5" tall, 4.75" widest base and 2.25" front to back. 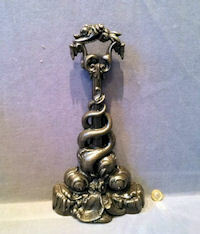 Oirginal, quality, late 19th century larger than average cast iron door porter or Mantle Ornament. 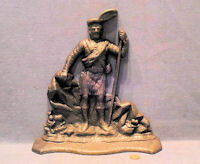 This detailed heavy door stop in deep rellief, depicts the Prince in full Kilt dress, a hat with a cockade and a staff on his arm. Consistantly pitted overall, but in good order otherwise and heavier than normal. 13" tall 12.5" widest base and 3" front to back at base. Original, quality, late 19th century, cast brass door porter with a cast iron counterbalance weight to the reverse. 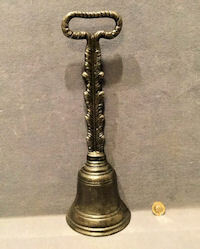 This example has a base of acanthus leaf forms, an upright stem with a shaped ring handgrip to the top, with a scallop design within. 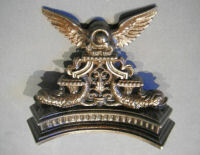 An unusual example, polished and lacquered, although the lacquer may be removed at no extra cost. Complete and in good order. 16" tall x 5.5" wide at base and 2.5" front to back. 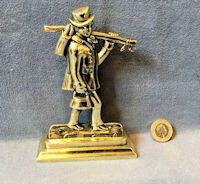 Original, quality late 19th century small cast brass mantel ornament with a well detailed figure of an 18th century gamekeeper or fisherman on a rectangular plinth. Polished and lacquered, although the lacquer may be removed at no extra cost and complete and in good order. 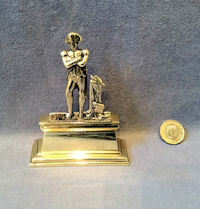 5.25" tall and base 3.75" x 1.25". 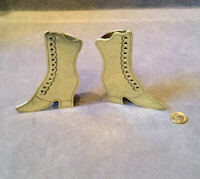 Original, quality pair of late 19th century spill vase mantel ornaments in the realistic form of Ladies button up boots. 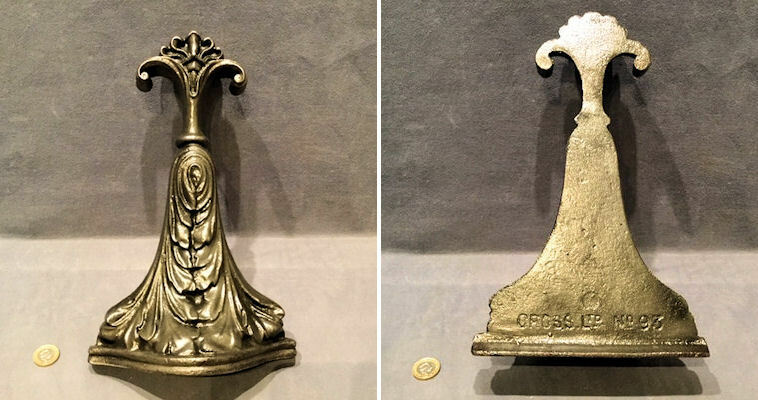 The reverse has a vase / pocket for posies or spills for lighting the fire. 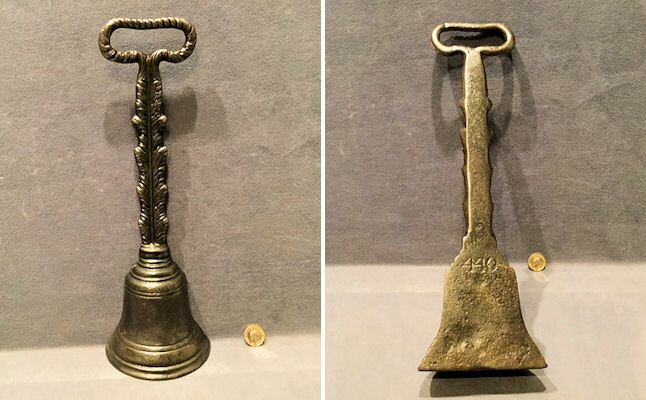 These examples are a good deal larger than normally found and unusual in copper. Polished and lacquered, although the lacquer may be removed at no extra cost and iare complete and in good and working order. 7" tall x 6.5" widest and 2" front to back. Original, quality late 19th century highly detailed cast iron mantel ornament in the form of a bear raiding the beehive (skep) under a bower, mounted on a rectangular plinth with claw feet. All has been cleaned and lacquered and is complete and in good order. 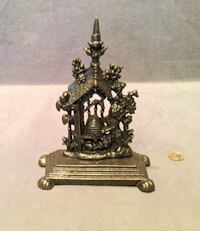 8.75" tall and base 6.75" x 3". 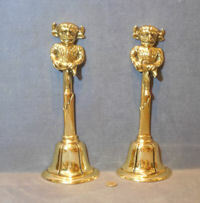 Original, quality pair of late 19th century brass spill vases / mantel ornaments fashioned in sheet brass as miniature clogs, punch decorated. Polished and lacquered, although the lacquer may be removed at no extra cost and complete and in good and working order. 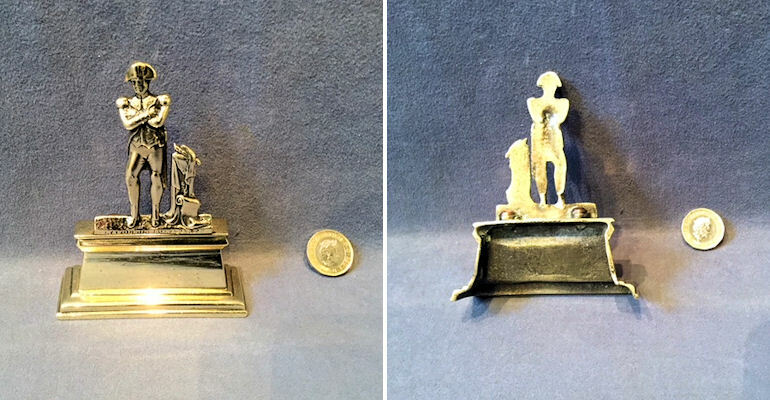 3.5" x 2.25" tall and 1.25" front to back. 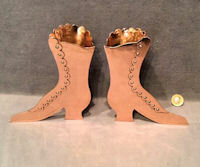 Original, quality pair of late 19th century mantel ornaments and spill vases in the form of a pair of Ladies' button up boots, fashioned from sheet brass, punch engraved. 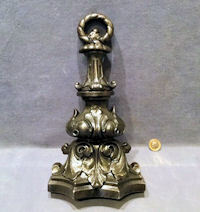 Polished and lacquered, although the lacquer may be removed at no extra cost and complete and in good and working order. 5" tall x 3.75" wide and 1.25" front to back. 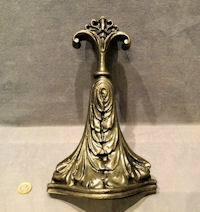 Original, quality, early to mid 19th century, cast iron mantel ornament. This example depicts Napoleon Bonaparte on horseback, taken from the painting "Crossing The Alps at St Bernards Pass". Cleaned, lacquered and complete and in good order. 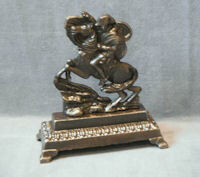 Plinth 6.75" x 2.75" + total height 7.5". Original, quality, 1920's, cast brass mantel ornament in the form of a musician in flowing robes playing a lyre, mounted on a plinth. Polished, lacquered and complete and in good order. The lacquer can be removed upon request, at no extra cost. Base 4" x 1.5" and 5.25" tall. 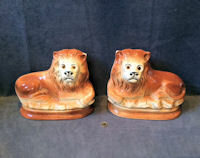 Original, quality pair of circa 1900 / 1920's larger than average Staffordshire pottery Lions on plinths, mantel ornaments or hearth decoration. These superb examples have painted detail to the face, the original glass eyes and "Sadler Burslem" to the underside for the manufacturer. Both the undersides have a short firing crack otherwise all are complete and in good order. 9.5" tall x 11.5" wide and 5.5" front to back.